A policeman’s diary handed down to his father offered mining historian Col Hooper a tantalising clue to the fate of a wagon linked to one of Queensland’s greatest mineral discoveries. John Campbell Miles laid the foundations for the mighty mining hub of Mount Isa with his lead and silver ore discovery in 1923 after earlier trying his luck at Kidston. “What has come to light only recently from the diary of a policeman at Dajarra in 1951, is the strange connection of the old town of Butru to Miles,” Mr Hooper said. Miles had bagged his ore samples and was camped on the banks of the Leichhardt River when he met a teamster called George Moinze, Mr Hooper said. He needed to transport his ore for assay and smelting to find out what it was worth. “George Moinze had the wagon taking supplies to places along the Leichhardt and said that when he came back, if Miles was still there, he’d load his ore on and take it to the rail head at Duchess,” Mr Hooper said. “So when he came back, Miles was still there with all his ore and he got Miles to help him load it on to the wagon. He said if it was worth money Miles could pay him, if not he didn’t owe him anything because he was backloading anyway. Mr Hooper said Moinze used to cart goods from the rail head at Duchess, and when it moved south to Butru he would cart from there. But by the 1920s motor trucks were starting to take over from horse and bullock-drawn wagons as a source of transport. Mr Hooper said a diary entry from around the 1950s by Dajarra policeman Pat Toohey had given him a lead regarding the wagon that carted Mount Isa’s fi rst ore. It read: “Butru siding was once a wagon depot for teamsters before the railway was extended to Dajarra. “When I was fossicking around the locality there were several old abandoned wagons, both bullock and horse, lying rotting away. “One old wagon had painted on its side the words ‘Pride of the West’ and the letter ‘i’ had been dotted. Upon reading the entry, Mr Hooper recalled a photograph John Campbell Miles had taken of the wagon and team taking his ore away. He put ‘two and two together’ and realised the policeman had stumbled on a relic of Miles’ discovery. “When I found that out I let everyone out in Mount Isa know and they all went out looking for this wagon (about five years ago), because if they could find any remains – well that’s the wagon that took the first ore out of Mount Isa,” he said. Mr Hooper said his friends found the site the policeman described. 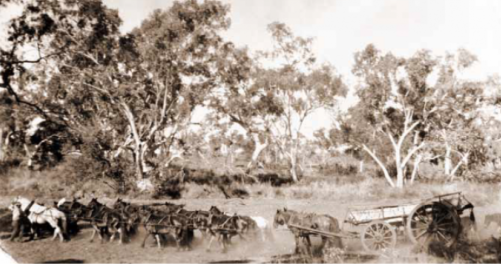 Sadly, thanks to the ravages of white ants and bushfires over the decades, they could only identify chains rather than the remnants of particular wagons. Mr Hooper has written and published 14 books on mining history, including Angor to Zillmanton – Stories of North Queensland’s Deserted Towns, which is in its eighth edition. (See https://www.desertedtownsatoz. com/ for more information).